Here we go again. 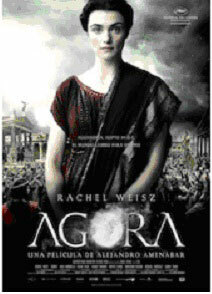 I just saw the new film Agora, which is a re-telling of the story of Hypatia, the brilliant woman philosopher from Alexandria, who was killed, supposedly by a mob of "Christians," in the year 415. Along with the tales of Galileo and Giordano Bruno, the legend of Hypatia is a favorite of anti-religious ideologues. I first heard the story from Carl Sagan, the popular scientist whose multi-part program "Cosmos" was widely watched back in the 1970's. "Cosmos" in fact comes to its climax with Sagan's melodramatic rehearsal of the narrative. Hypatia, he explained, was a scientist and philosopher who ran afoul of Cyril, the wicked bishop of Alexandria, who then stirred up a mob of his superstitious followers who subsequently put Hypatia to death. Sagan commented: "the supreme tragedy was that when the Christians came to burn down the great library of Alexandria, there was no one to stop them." And just to rub it in, he said, "and they made Cyril a saint." Sagan's account found its roots in Edward Gibbon's version of the story in his deeply anti-Christian classic The Decline and Fall of the Roman Empire. In fact, Gibbon was the first to link the murder of Hypatia with the burning down of the Alexandrian library. Alejandro Amenabar's new film stands firmly in the Gibbon/Sagan tradition, presenting Hypatia as a saint of secular rationalism who desperately gathers scrolls from the library before it is invaded by hysterical Christians and who goes nobly to her death, defending reason and science against the avatars of religious superstition. Well, Hypatia was indeed a philosopher and she was indeed killed by a mob in 415, but practically everything else about the story that Gibbon and Sagan and Amenabar tell is false. For the complete de-bunking of the Agora myth, take a look at David Hart Bentley's book Atheist Delusions, but allow me to share just a few details. The library of Alexandria was burnt to the ground, not by Christian mobs in the fifth century, but by Julius Caesar's troops, some forty years before Jesus was born. A temple to the god Serapis, called the Sarapeon, was built on the site of the ancient library (and there might have been some scrolls in it in the fifth century), and it was this building that was sacked by angry Christians in Hypatia's time, in response to pagan defilements of Christian houses of worship. Now mind you, I'm not excusing any of this for a moment. Whenever Christians respond to such attacks with violence, they are opposing themselves to the one who said, "Love your enemies" and "Turn the other cheek." But I am indeed insisting that the charge that Christians mindlessly and gleefully destroyed the greatest center of learning in the ancient world is a calumny. More to it, Hypatia, sadly enough, found herself caught in the middle of a struggle between two powerful figures in Alexandria, namely, Orestes the civil authority and Cyril the bishop. She was most likely killed in retaliation for the murder of some of Cyril's supporters by agents of Orestes. Again, all of this is nasty stuff, and I'm not trying to exculpate anyone, but to pitch this largely political story as a battle between sweet reason and vicious religious superstition is misleading to say the very least. Finally, though the film portrays her largely as an astronomer (probably to compel comparisons with Galileo), Hypatia was best known as a neo-Platonist philosopher, a devotee of Plato and Plotinus. Not only were there Christians in Hypatia's classes, not only were Christian bishops among her circle of friends, but Christian theologians – Augustine, Ambrose, and Origen, just to name the most prominent – were enthusiastic advocates of neo-Platonism. Therefore, to portray her as the noble champion of reason over and against mouth-breathing Christian primitives is just ridiculous. But none of this gets to the heart of why I object to Agora. In one of the most visually arresting scenes in the film, Amenabar brings his camera up to a very high point of vantage overlooking the Alexandria library while it is being ransacked by the Christian mob. From this perspective, the Christians look for all the world like scurrying cockroaches. In another memorable scene, the director shows a group of Christian thugs carting away the mangled corpses of Jews whom they have just put to death, and he composes the shot in such a way that the piled bodies vividly call to mind the bodies of the dead in photographs of Dachau and Auschwitz. The not so subtle implication of all of this is that Christians are dangerous types, threats to civilization, and that they should, like pests, be eliminated. I wonder if it ever occurred to Amenabar that his movie might incite violence against religious people, especially Christians, and that precisely his manner of critique was used by some of the most vicious persecutors of Christianity in the last century. My very real fear is that the meanness, half-truths, and outright slanders in such books as Christopher Hitchens's God is Not Great and Richard Dawkins's The God Delusion have begun to work their way into the popular culture. We Christians have to resist – and keep setting the record straight.